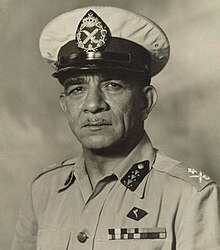 Muhammad Naguib (Arabic: محمد نجيب‎, Egyptian Arabic pronunciation: [mæˈħæmmæd næˈɡiːb]; 20 Februar 1901 – 28 August 1984) wis the first Preses o Egyp, servin frae the declaration o the Republic on 18 Juin 1953 tae 14 November 1954. ↑ "ذاكرة مصر المعاصرة - السيرة الذاتية". Modern Egypt. Retrieved 22 December 2012.